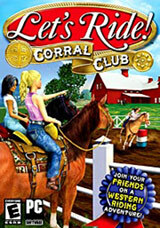 Lets Ride Corral Club Own and care for your dream horse! Own and care for your dream horse! Personalize your character by picking out her clothes, boots, hair color, and hat. You even get to name her! 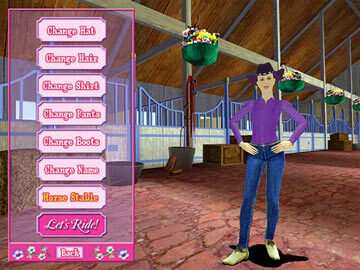 Start with 12 beautiful horse breeds, customize their manes, choose the perfect saddle, and more. 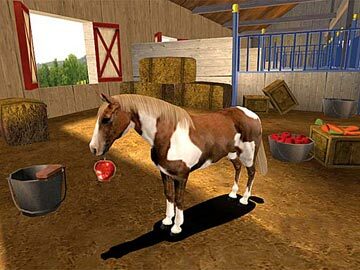 Head to the corral to prepare you and your horse for the big barrel racing competition. Practice hard, its tougher than it looks! 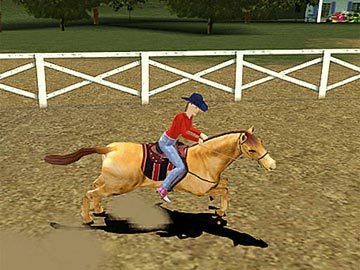 Take a stroll through the pasture, galloping, cantering, or trotting with your horse. Even race around barrels to sharpen your skills, competing against your own times. Hear the crowd cheer you on as you race at the rodeo competition. Do your best at the local events to qualify for the regional, county, state, and national competitions. View your high scores, your ribbons and even your competition points in the Scrapbook. You can even share pictures of you and your horse with your friends!